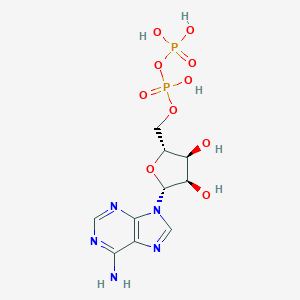 Adenosine diphosphate, abbreviated ADP, is a nucleotide. It is an ester of pyrophosphoric acid with the nucleotide adenine. ADP consists of the pyrophosphate group, the pentose sugar ribose, and the nucleobase adenine. ADP is the product of ATP dephosphorylation by ATPases. ADP is converted back to ATP by ATP synthases.